We Search Trusted Retailers DAILY to find you the best deals on Double Headboards and the latest Double Headboards sale to save you money. Shopping for a cheap double headboard that still looks great, takes some searching, but they are there to be found. It does pay to know what you're looking for in a low priced headboard that is. We've put a small list on the different types of headboards that you can find. Comfort Headboard If you read or watch TV in bed, then you’ll be better off with a padded or upholstered headboard. Since you’ll be leaning against it, a dark colour or print will disguise any marks, but it's always best to go with something that matches the style of the bedroom and the colour scheme you have selected. Upholstered Headboards These are ideal for comfort and can create a striking statement if covered in bold, patterned fabric. Buttoned headboards are back in fashion and now come in sleeker, streamlined shapes giving them a modern edge. Look out for buttoned headboards upholstered in suede for the ultimate in luxury and comfort. Leather Headboards These are good for bringing a sleek, modern look to contemporary bedrooms, but remember, the leather can be cold so you may need a few extra pillows. Wooden Headboards A cheap wooden double headboard is great for country-style bedrooms and traditional schemes. They may look a little out of place in a modern looking bedroom, so make sure you match them correctly. Metal Headboards A quality cheap double metal headboard will give a room a chic, urban feel, which is great for minimal style bedrooms. It's also one of the cheapest styles of double headboards too. If you're buying a bed from scratch, you may want to consider choosing a bed with a headboard already attached. You’ll be guaranteed that it all matches and you won’t have the expense of buying a separate headboard. However, your choice will be more limited and you’ll have to change the bed as well as the board if you fancy a new look. Buying a cheap headboard for a divan bed is pretty easy. There is loads of choice out there and it will be easy to change if you feel like a new look. Remember to check out the bed’s fittings before you buy as not all headboards fit all beds. One thing to note on the style front is if you decide to choose a headboard thats wider than the buy you're buying it for, can give you a cool contemporary look and looks great on a bedroom with a modern finish. And our top money saving tip when it comes to cheap double headboards is, you can buy a cheap plain double headboard, and then add wallpaper to it to match any look that you like. It's so easy to do and gives the headboard a far great look, for a really low price. Plus, this can also be change very easily too. To buy a cheap double headboard there are a load of places that you can shop around. We like the ones that you can pick up for really cheap, but look really good. We've narrowed this choice down to just 3 of the UK's biggest bedroom furniture retailers. Each have there own low prices on double headboards. They have cheap double headboards from £49.99, and some really top brands on offer too. They have Silentnight headboards, Airsprung and The Collection at Argos headboards. These are the best value for money ones from Argos we feel. Going for a branded headboard can often not be the best way to spend money on getting the bedroom looking the way you want. Being more creative with the rest of the space and saving money where possible is far better at giving you a great unique modern space. Dreams Headboards For a fantastic range of truly luxurious headboards, then you should head over to Dreams. They have a load of different styles to look at. The collection of cheap upholstered headboards are great and give you an amazing look, for a decent money saving. They have a double upholstered headboards for under £80. 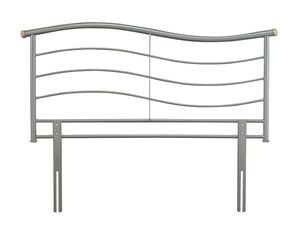 This is one of the best value for money headboards that we can find. Dreams are also great when it comes to choice of brands for a double headboard. They have their own brand, but also the big names in bed furniture too. Names like, Sealy, Tempur and Hypnos. All giving out the best in quality for a small price. Mattress Man Headboards When it comes to the biggest choice you can find on the internet, Mattress Man has got you covered. They have an absolute huge range of cheap double headboards of all types. 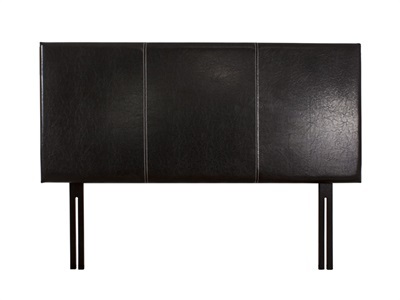 Upholstered, leather, wood and metal, all at really low prices. The leather ones give a bit of luxury to your bedroom, without actually costing that much. 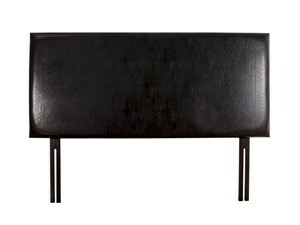 You can get a double leather headboard for under £70. Great value for money. They probably have the biggest selection of brands at Mattress Man too. They have all the top brands, like Sealy and Relyon and Balmoral headboards, but they also have the lower priced brands that still have a good level of quality, but a much more affordable price. Cheap headboard brands like New Designs and Snuggle Beds headboards. These are the best places we think to get good money saving deals on a new double headboard. All the prices for these headboards is laid out on this page in order of the cheapest headboard all the way up to the most expensive headboard.